Born Lucien Pierre Brouillard in St. Eugene, Quebec, Canada on May 23, 1911. 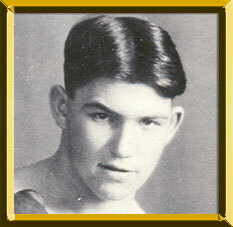 As a child Brouillard moved to Worcester, MA and soon took up boxing. With broad shoulders and an awkward southpaw stance, he turned pro in 1928 and began a steady march to the world welterweight title. With a devastating left, he used a solid body attack to rack up early victories, including 11 knockouts in his first 14 wins. Wins over Baby Joe Gans, Canada Lee, Paul Pirrone and Young Jack Thompson set him up for a welterweight title go. On October 23, 1931, he defeated Thompson over 15 rounds to win the world title. He lost it the next year to Jackie Fields. After losing the title, he defeated “Babyface” Jimmy McLarnin over 10 rounds. Now campaigning as a middleweight, he stopped Ben Jeby in 7 rounds for the New York world middleweight championship on August 9, 1933. The NBA later recognized him as champion as well. On October 30, 1933, he lost his title to Vince Dundee. Two victories over Bob Olin, followed by wins over Young Corbett III and Gustave Roth positioned Brouillard for a shot at Marcel Thil's middleweight title. Brouillard would meet Thil twice in Paris for the title, losing each time via dubious disqualification. He continued to box, including bouts with Teddy Yarosz, Tiger Jack Fox, Gus Lesnevich, Georgie Abrams and Lloyd Marshal before retiring in 1940 with a 107-29-2, 2 ND (66 KOs) record and reputation as fighter with an awkward style that made him very difficult to fight. Brouillard operated a crane and rigger at a steel shipyard from his retirement until 1970. He died September 14, 1984 in Taunton, MA.